Arctic is an online multi-player fantasy role-playing game loosely based on TSR's Dragonlance novels. We invite you to come and meet players from around the world while you earn experience and treasure, take part in quests, solve puzzles, and slay foes. Will you choose to be a spellcaster or a sword-wielding barbarian? Will you follow a dark god or a good one? Whatever your path, our best advice is to be brave, for Krynn is sometimes a dangerous place! Arctic is 100% free to play, and has been since 1992. The game has never stopped growing and changing - our world is massive! 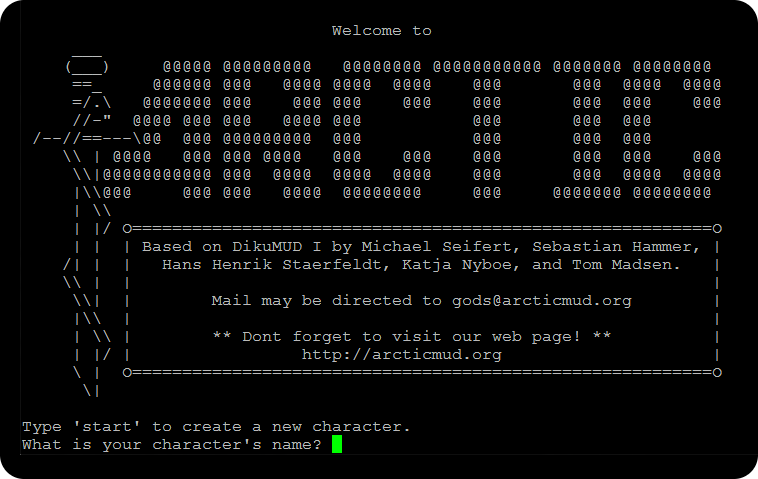 Connect with any MUD client to mud.arctic.org (port 2700). Are you a new player? Welcome! We encourage you to find out more about what a MUD is. There is little emphasis on role-playing, and character interactions are handled in a real-world manner left up to the players. This means that when there is competition or disputes between players and characters, these confrontations can sometimes end in violence. Stealing from and killing other player-characters are not necessarily encouraged, but it is allowed.